Don’t Blame It On The Moonlight. Don’t Blame It On The GOOD TIME! I met Foxycat Nina at the Kebab Mahal for a pre-theater curry, Lamb Jalfrazi and a Chicken Khari, with garlic nan and rice. It was very nice. The Festival Theater is just around the corner. So we didn’t have far to walk after our spicy treat. I collected our tickets from the press ticket allocation chap and we were directed up to level three. Our seats were in the Dress Crircle with a brilliant view of the stage. 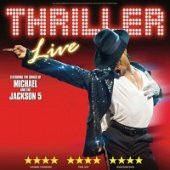 Thriller spelled out in large red luminescence, a very impressive stage set.Tantalizing the audience for the delights that were to follow.